The ability to effectively supervise others is the most sought-afterand the most elusiveskill in today’s organizations. This workshop is a fresh spin on good supervision. You'll get skills and tools you can immediately back in your office. 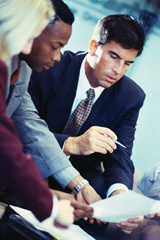 The workshop's foundation, "Situational Leadership", has helped millions to be more effective supervisors. All current supervisors, managers, team leaders, and project managers who supervise others but have limited or dated formal supervisory training. Also highly suited for technical experts who are new supervisors or team leaders.